Fabinho applauded Jurgen Klopp's man-management style, convinced the Liverpool boss knows what is best for his players' development. Klopp has earned wide acclaim ever since joining Liverpool in 2015, with the ex-Borussia Dortmund boss introducing an entertaining brand of football and overseeing a notable improvement in team who lead Premier League champions Manchester City by four points at the top of the table. He has also been praised for his impact on the players themselves, with Klopp putting trust in youngsters and ensuring others have improved. Fabinho is one of those to have made significant strides, as the Brazilian struggled to get in Liverpool's team initially after joining from Monaco for a reported £44million in July. 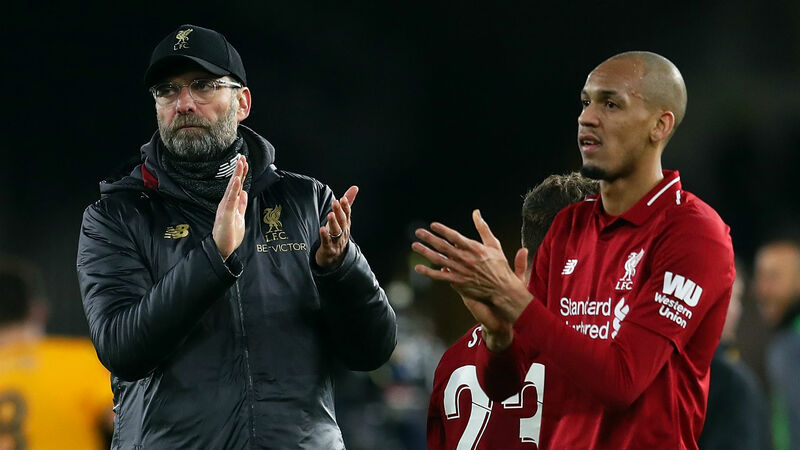 There were reservations about Fabinho's positioning and suitability to Klopp's system, but he has become a more regular starter in recent months and he saluted his manager's influence. "The relationship with the coach is good," the midfielder told Liverpool's official website. "He has a different way of speaking to each player. "He understands things about us, things we need to improve on. He'll tell you what he wants you to do on the pitch concerning movement, so that when we're on the pitch we understand the best options for us. The relationship I have with him is very good." With Liverpool enduring something of a defensive injury crisis, Fabinho had to fill in at centre-back in Saturday's 1-0 win at Brighton and Hove Albion and he felt comfortable there. "I'd already played the previous game as a centre-back against Wolves," he added, referring to the Reds' 2-1 defeat in the third round of the FA Cup. "I think it went well, I had a good understanding with Ki-Jana Hoever [against Wolves], the communication was good. "Regarding positioning, I improved throughout the game in this aspect. I did well, and in the last game against Brighton, I think I played well. "Playing alongside [Virgil] Van Dijk helped, he's really vocal, he guided us. He helped me a lot. I had good communication with Trent [Alexander-Arnold] and also with Hendo [Jordan Henderson]; they were the players closest to me on the pitch. "In general, I think it was a good game. In this position, which I haven't played in a lot, I think I adapted well. There are some aspects, such as positioning, that I need to improve on.